In this article, I would like to explain Java standard naming conventions, which we will follow as the best practices. We should follow these naming conventions in the day to day project work. Let's discuss package,class,variable,method,constant,abstract class and exception class naming conventions with examples. The prefix of a unique package name is always written in all-lowercase ASCII letters and should be one of the top-level domain names, like com, edu, gov, mil, net, org. Class names should be nouns in UpperCamelCase (in mixed case with the first letter of each internal word capitalized). Try to keep your class names simple and descriptive. Use whole words-avoid acronyms and abbreviations (unless the abbreviation is much more widely used than the long form, such as URL or HTML). 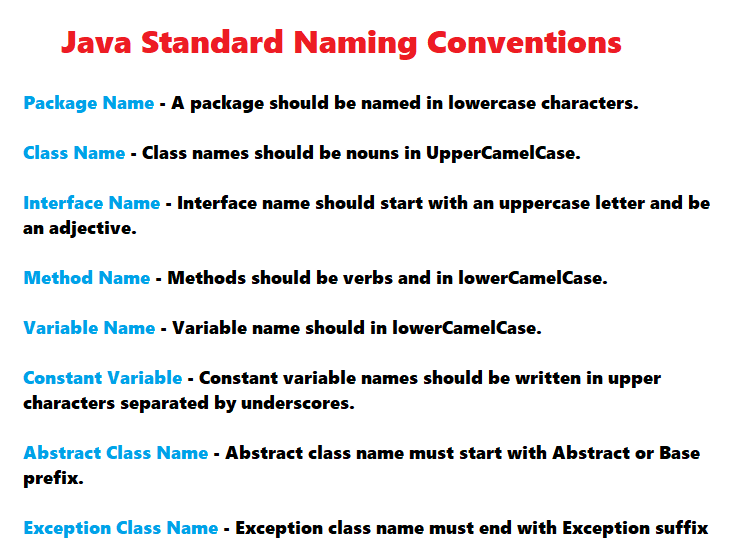 The class naming convention used by Oracle for the Java core packages. Interface name should start with an uppercase letter and be an adjective. Methods should be verbs, in mixed case with the first letter lowercase, with the first letter of each internal word capitalized (lowerCamelCase). Constant variable names should be written in upper characters separated by underscores. These names should be semantically complete and clear. I observed in many standard libraries, the naming conventions used for Abstract class is class name must start with Abstract or Base prefix. This naming convention can vary from organization to organization. I observed in many standard libraries, the naming conventions used for custom Exception Class is class name must end with Exception suffix. The exception class naming convention used by Oracle for the Java core packages. Apart from above java standard naming conventions, there are few more naming conventions would be followed in many standard libraries such as Spring, Apache, Hibernate etc. Note that these naming conventions can be varied as per different libraries or organizations. 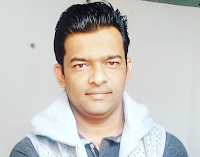 is prefix can be used for boolean variables and methods. Give the reader the immediate clue that this is a potential time-consuming operation, and if used repeatedly, he might consider caching the result. Consistent use of the term enhances readability. Give the reader the immediate clue that this is a simple lookup method with a minimum of computations involved. Consistent use of the term enhances readability. The Plural form can be used on names representing a collection of objects. The name of the object is implicit and should be avoided in a method name. Please write comments, if you want to give any suggestions or feedback about my articles would be appreciated. Very good and unique article.